Although roses were once popular throughout Europe during the reign of the Roman Empire, they soon lost their importance once the empire went into decline. Almost forgotten, it was the Crusaders of the twelfth and thirteenth centuries who brought them back from their Eastern travels reviving their popular interest. Before long the rose found its way back into the gardens of rich noblemen and wealthy merchants. There was even some profit to be made with the return of this forgotten plant as their bright red petals were used in the production of rose-petal syrups and conserves. These were popularly sold on the pretence of 'dubious' medicinal properties, but later this formed the basis of the rose-petal industry and used in the production of perfumes. 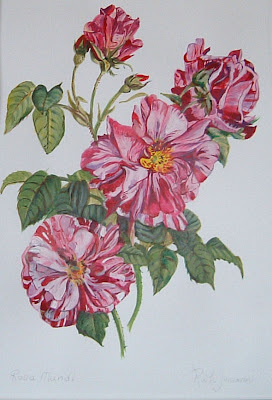 During this period the most popular rose grown was the ‘Apothecary’s Rose’- Rosa gallica officinalis. It was also known as the ‘Red Damask which later became the famous ‘red rose’ emblem of the Lancastrian family. 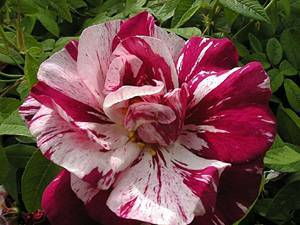 It was this particular rose that underwent a natural colour mutation to produce the now legendary striped rose Rosa gallica versicolor (so called as it could revert at random into an all red state). Just like the broken tulips of the Dutch Tulip mania period these striped petals would have caused an absolute sensation bringing it to the attention of the Europe's rich and famous. This plant is famously better known as the ‘Rosa Mundi’. Rosa Mundi was first described in 1583, and according to 'The Garden Book' of Sir Thomas Hanmer (published in Eng­land in 1659) it was originally found in Norfolk '...upon a branch of the common red rose...'. 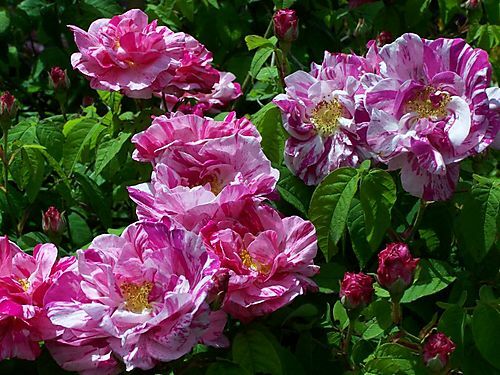 However there is an earlier legend which states that the ‘Rosa Mundi’ was named after Rosa­mund Clifford, the mistress of King Henry II who reigned as England’s monarch from 1154 to 1189. Rosamund Clifford (1150-1176), also known as the "The Fair Rosamund" or "Rose of the World", was the long-time mistress of King Henry II. Henry was forced to marry Princess Eleanor who, jealous of her husband's relationship with the fair Rosamund, is said to have had her murdered by poison. After her death, Henry and Rosamund's family paid for a tomb at Godstow Nunnery near Oxford and put an endowment in place for it to be attended by nuns who were instructed to place Rosa Mundi flowers upon it on the anniversary of her death. This became a popular local shrine until 1191 (two years after Henry died) until St. Hugh of Avalon - Bishop of Lincoln happened to visit Godstow Nunnery and saw Rosamund's tomb right in front of the high altar. It was covered with rose flowers and lit candles, and upon calling Rosamund a harlot, ordered her remains to be removed from the church. Her tomb was taken to the cemetery at the nuns' chapter house close by but it eventually became destroyed during the 'Dissolution of the Monasteries' between 1536 and 1540. A large specimen of ‘Rosa Mundi’ is still a stunning sight in the height of summer and its semi-double flowers are among the largest of all the old fashioned roses. It is the oldest of the all striped varieties grown today, and because of it natural disease resistance it has lasted well through the centuries. If you have a good look around, it's still available today at most good plant retailers.